Checked prices from shippers right in the market yesterday. You can buy stuff and haul it over there piece by piece if you can’t carry it all. You could probably hire someone to cart it too, but hauling treasure through the market is a point of pride. Best rates for FedEx air freight (6 to 8 days) are 26 rmb per kilo 20kg to 50kg, and 24rmb for 50kg plus. They packed the test rig well and boxed everything for no extra charge. 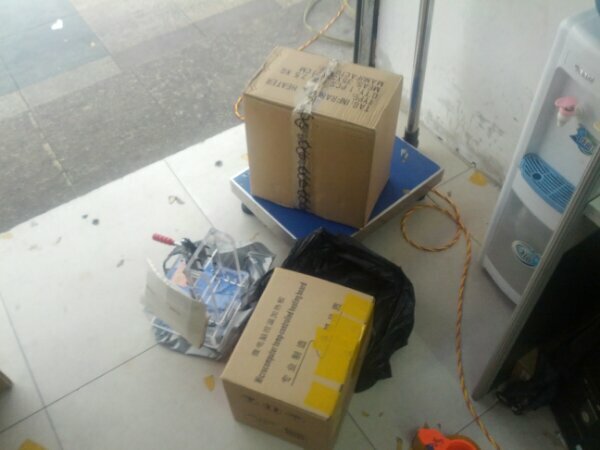 Initially our haul was 17kg, which would be 660rmb (110 bucks). 21 kg is only 548rmb so we had to add a few things last minute. First we got a few bars of solder for solder pots, that was another 2kg. Then, in an act of desperation, we bought a 2kg rock for 10rmb from a guy digging up the sidewalk. Take that FedEx! This entry was posted on Tuesday, January 22nd, 2013 at 9:22 am	and is filed under #liveupdates, Global Geek. You can follow any responses to this entry through the RSS 2.0 feed. You can skip to the end and leave a response. Pinging is currently not allowed. If customs here saw that they would refuse to let it in (the whole package) without you paying $ to have it bombarded with radiation to kill any organisms/diseases. They may even reject it outright. It was a new clean brick or two from a pallet so I think about the same risk as anything else were shipping. Our customs isn’t crazy about the bio isolation, i can bring 10kg of fresh produce home for “personal use”…and have a dozen times. Meat, dairy, and shoes from farms seem to be the ag biggies from my current corner of then world. The bio quarantine is indeed what stopped me from just plucking a random dug up chunk of concrete from the rubbish pile ;) I once lived in Hawaii where that was crazy important. Oh I declared it! It wouldn’t be as fun if I didn’t. Where did you ordered this parts? Which website? These aren’t from the web. Picking these up from the huaqiangbei market in Shenzhen China and shipping back to the workshop. Thank you of answer. Rather, I will not be going to Shenzhen in the nearest future ;) Do you know why this shops in huaqiangbei doesn’t have online stores? Most are just ‘outlet’ stores. Most stores can be contacted by email or QQ, which is a chinese MSN/ICQ clone. b) it can be tricky, if you don’t read/write simplified Chinese then you have to work pretty hard at understanding the machine translation sometimes (of course, use Chrome to access Taobao so it translates everything on the fly, best invention ever), sometimes hard to see if there is a minimum, and sometimes the items are just not in stock. Things to note, “item” comes out “baby”, and sometimes the sign for yuan is translated as $, but the amount is still yuan. Searching is best accomplished by translating what you want in english to simplified chinese (using translate.google.com of course) and searching for that, hopefully you find some things like what you want and maybe can work out other things that the chinese might call them to expand your search. c) check ebay before buying, don’t assume a taobao seller is cheaper, not everything there is dirt cheap, and if you buy on ebay with paypal then you have far more protection! If you are only needing a few of something from one store, it’s almost certainly cheaper if there is an ebay seller with that same thing. Taobao is better for buying multiple things from the same seller, and for more esoteric items that are not on ebay, at the least your Taobao order is going to cost 50 yuan for commission and domestic shipping, and then whatever the international shipping is, so you likely need to buy quite a lot of stuff in a single order, preferably from a single seller, to make it cheaper than ebay. You’ll need an agent if you’re not in China, I have used taobaofocus a couple of times, the only couple of complaints I have about them is that their ordering process by default rounds up to the nearest Yuan, eg, buying 100 led’s for 0.06 yuan each, TBF will ask you to pay 100 yuan up front – assuming the total order ends up (after shipping) being less than you paid, they will refund the change, but in the mean time it’s annoying. All the agents charge in 2 stages, first you pay for the expected item amount, commission, and domestic shipping, then you pay for the international shipping once they have it all ready to ship. And secondly, don’t rely on getting status update emails from them, you need to login to their site daily to check on the status of your order to see if any action is needed (once they have ordered, some items might be cancelled due to no stock so you might want to add other things to the order, once the items are delivered to them you need to approve & pay international shipping – none of these things generates an email to me, only way I know is to check each day). Ouch, wall of text, what happened to my paragraphs! Maybe an admin can fix that?